One of the growing trends in creating more of a fun atmosphere at a wedding reception is the practice of hiring a photo booth. Having one available creates an amazing experience for all of your guests. It will be a focal point for some great fun. But in order to make sure that all goes well, you need to make sure that you do a little bit of homework in order to hire the professional photo booth that will provide the most pleasure for all of your guests. So, as you tool around the Houston area in your search for a photo booth for your wedding, make sure you have a copy of this guide to help you along. You are probably wondering where do you even begin with this kind of search. A good start is to talk to your family, friends, or coworkers about photo booths they have seen and operated at any kind of event. Also, your wedding vendors should be able to give you some contact names. And don't forget to do a Google search for photo booths in the Houston area. Try to accumulate at least three to five potential candidates that you believe warrant checking into. Contact each candidate and setup a meeting. We have one word that you will want to keep in mind: quality, quality, quality. There is a wide range of photo booths in terms of quality. And we highly recommend that you do not skimp on this hire. You do not want this to be an eye sore, but you want something that will look really cool. 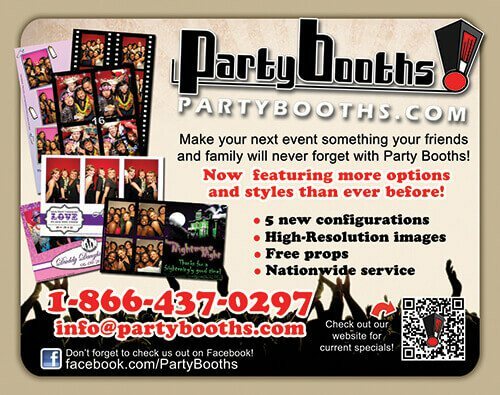 Ask to see pictures of the photo booth that the vendor will be providing to you. Even better, ask if you can possibly see the real deal and to see it in operation. What style of booth do you want? For instance, there are open air booths and there are fully enclosed booths where your guests will have some privacy. At the same time, various photo booths have many different looks based on what they are made of. Some are made of aluminum and cloth, some are made of wood, some have a bench to sit on while others only allow you to stand. How many people will be able to fit inside of your photo booth? Take to each vendor about the size they can provide and what would be best for you. There are booths only two people can fit into. Keep in mind that this will result in long lines and it is just not as much fun. We recommend a photo booth that can hold up to 8 to 10 people. What kind of camera does the photo booth use? Ask them about booths that use DSLR cameras, they produce much better quality shots. Ask about the quality of the printer that will be used? This is also extremely important. A dye-sublimation printer is much better than an Inkjet so insist on the former.. Ask them what the bottom line price will be for everything. This is one of those industries that is notorious for hidden fees. Keep asking until you get a straight answer. If you have followed this guide very carefully, we feel confident that you should be ready to make a hire that will totally satisfy you and all of your guests. Now, go get your picture taken and have some fun.